Let the computer analyze your precision listening skills and improve your pitch retention. Your computer must have an adequate microphone. The scientific approach lets you assess your current standing - observe progress over time. Choose Macintosh or Windows version. SamePitchPlease helps you to improve your pitch skills. Same-Pitch-Please has a simple goal: to improve your Pitch Ability. What do we mean by Pitch Ability? The ability to reproduce the pitch of a pitched sound by your voice. The time time that can pass between a heard pitch and the correct reproduction of that pitch. For the first point, we simply measure the pitch of your singing for one second. Since every voice has a natural vibrato, we take the mean from your singing (or humming) over the measured one-second period. To determine the second point, we take the measuring of your pitch precision after a specified time. In order to express your pitch-ability as a number, we have defined that the deviation of the produced pitch must be less than than fifty cents off of the heard pitch. This allows us to express the pitch-ability as the time between the heard pitch and the correct reproduction. One skill for every musician is pitch accuracy. That is the ability to recognize if a pitch is correct, higher or lower. Usually, you can improve this ability by ear training. There are many programs for ear training and they have different aims and approaches. The goal for Same-Pitch-Please is to improve your absolute pitch memory. In our program Listening-Singing-Teacher we use the approach of growing melodies. That is you have to listen to a short melody of three, five, eight or more notes, before you can start to sing them back. This improves your relative pitch memory. 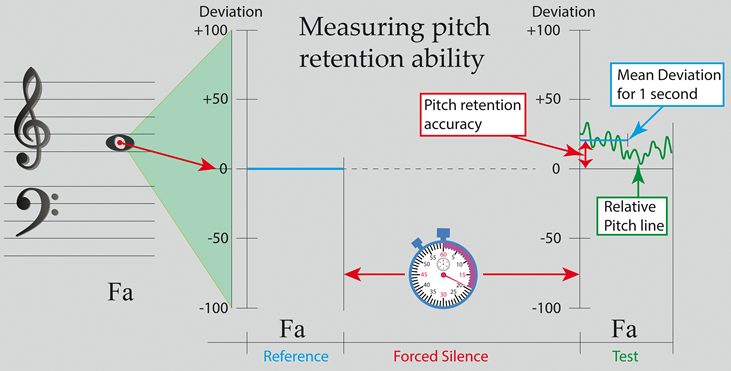 To train your pitch memory for absolute pitch, we have developed the Pitch-Ability-Method. The method first helps you to find pitches that you can produce and remember best. That is the method starts with eight notes that you can freely choose and tests your precision of the pitch reproduction ability over time. Since to claim absolute pitch you would have to prove that you can produce a pitch correctly even after a day is very boring and time consuming, we have defined a new term: Felix's Pitch Point. Felix's Pitch Point is not equivalent to absolute pitch. You can prove that you have reached Felix's Pitch Point in less than 20 minutes. That is Felix's Pitch Point requires only 4 notes you must be able to reproduce correctly after 4 minutes. Since most people rely on their relative pitch abilities, it makes sense that during the training the number of notes get reduced from eight notes to one. To the one you can remember and reproduce best. In this way you can later use your relative pitch skills to for the other notes. Thus, the Pitch-Ability-Method decreases the number of notes from eight to one by eliminating the notes you can reproduce worst. After the time between the hearing of the note and the reproduction of the note reaches four minutes, the program starts to add the eliminated notes back in reverse order. Since a training block should not exceed 20 minutes, after adding back the fourth note, Felix's Pitch Point is reached. The program continues to add back the rest of your chosen notes and allows you to test your pitch retention memory for a duration of up to 20 minutes. However, we think that by reaching Felix's Pitch Point you have grasped a handle on how to store pitch in your long-term memory. Same-Pitch-Please has a scientific approach to absolute pitch: It allows you to measure your pitch-ability. So, not the same as absolute pitch, it allows in reproducible test environments to measure the most important aspect of absolute pitch: The correct reproduction of a pitch after a certain time. The most important rule of the test is silence during the test period. The test should be made similar to high jump sports, where you can set a starting height, and if you pass, you can increase the level. Instead of the height, the time is the unit that gets used to determine your pitch ability. Same-Pitch-Please allows you to push your pitch memory for single notes. Having a good pitch memory not only for relative pitch, but also for absolute pitch, helps you to recognize, when you are drifting off key over time. Download (Mac/Windows)the trial version and see for yourself. Pitch Retention Time Line progression Statistics. Same Pitch Please introduces you to Felix's Pitch Point, the Pitch Ability Method and how you can measure your personal Perfect Pitch Point. It also introduces you on how the exercises work. "The Pitch Ability Method" and "Felix's Pitch Point". Pitch Ability Test Test your Pitch Ability. A possible explanation on How we remember sounds and pitches. Is absolute pitch useless?Relative Pitch is more important doesn't mean absolute pitch is useless. Thoughts about Why less than one percent of the people have absolute pitch.